C1611. 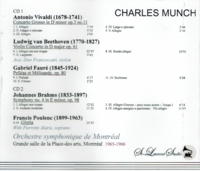 CHARLES MUNCH Cond. Montréal S.O. 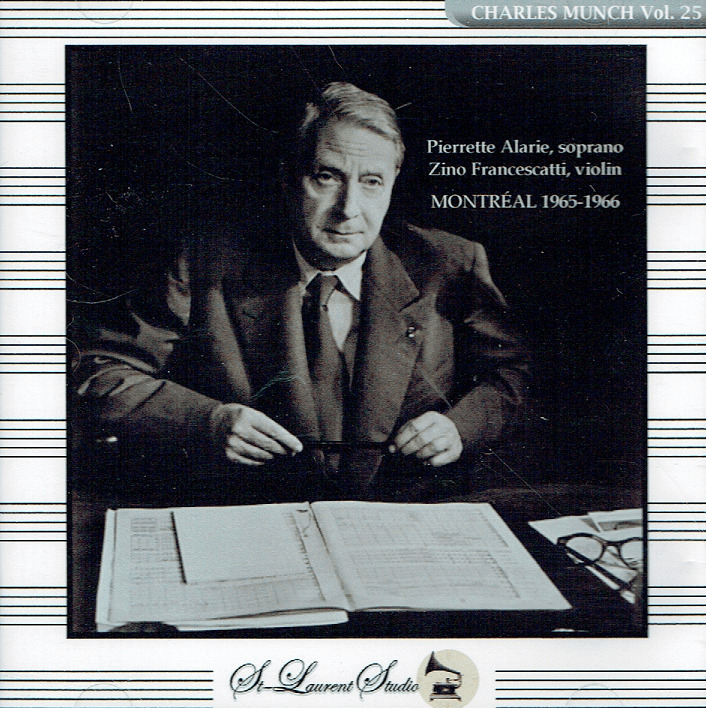 : Concerto Grosso in d (Vivaldi); Pelléas et Mélisande - - Excerpts (Fauré); Symphony #4 in e (Brahms); w.Zino Francescatti: Violin Concerto in D (Beethoven); w.Pierrette Alarie: Gloria (Poulenc). (Canada) 2-St Laurent Studio YSL T-571, Live Performances, 1965-66, Salle Pelletier, Montréal. Transfers by Yves St Laurent. "Zino Francescatti (1902-91) was a musician's musician who won over audiences more by charm than prowess. His unmistakably French manner was out of vogue in an era-dominated by Russian-trained violinists, but so much the better for him. He was trained by his father, a concertmaster in Marseilles, and performed in the Straram Orchestra of Paris before coming late to a career as a soloist and chamber musician. 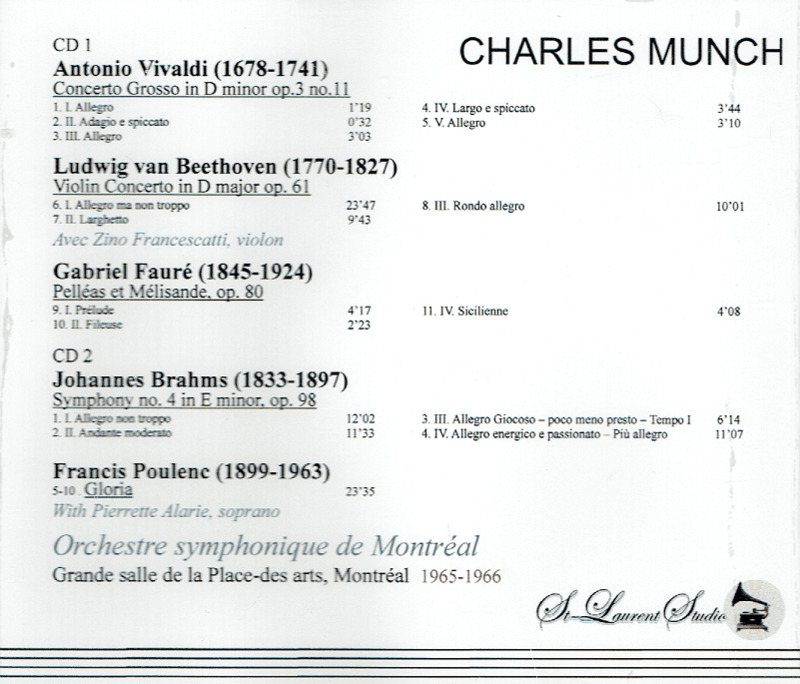 He was not the last French violinist standing, though in the 1950s it could seem that way. While his repertoire was wide, Francescatti's recordings naturally emphasized French music, where he figures as a latter-day Jacques Thibaud. He has the same rich, dark tone; but while his phrasing is also very lyrical, it tends to be more tempered and neoclassical. This seems more of a generational difference than anything else." "Everything about Francescatti's approach to every piece he plays is unique. He does not follow any 'school' of interpretation, and the only similarities that I noticed from piece to piece is that he is an impeccable violinist, and as a musician he stretches the boundaries of expression while always playing with exquisite taste. There is something regal about his playing, and at the same time there is a deep sense of musical integrity - a kind of moral directive from within that compels him to play beautifully and honestly for the sake of the music and the sacred nature of the performance."